I screwed up straight from the start and now I'm in a bit of a pickle. Hopefully you guys can offer up some suggestions. I'm building a Honky Dory that is full plascore. When I was building the sides I didn't pay enough attention to the plans and glassed the full 4x16 jointed sheet of plascore on one side. I then cut both sides from that piece. This effectively gave me one side with the glass on the outside and one on the inside. Continuing with the boat it worked out fine and I figured I would just glass the bare inside piece when it was time. The bottom glassed up fine and she is flipped over to begin working on the inside. Here is the problem. I have one side (inside) without fiberglass (just bare plascore). My concern is that without the rigidity of fiberglass on the inside of that side pulling the ribs will cause the boat to deform and worsen the problem I am already afraid is lingering. I'm considering three options. Option 1: place a strip of fiberglass on the bare plascore from top to bottom and then fit my permanent plascore "ribs" in. I can then remove the temporary wood ribs and glass the separate sections. Option 2: calculate somehow the shape of the permanent ribs. Then remove the wooden temporary ones and glass the entire inside panel. Once that is done hopefully I can force the side back into shape when putting in the permanent plascore rib. Option 3: Cut out all of the ribbing material except the part going across the top of the boat creating temporary cross bracing and then glass the bare side except for the small areas of contact with the cross braces. I can them remove the cross braces and glass those small areas. Does anyone have better suggestions or a preference for one of those solutions? This boat has been sitting for the better part of a year as I mull over what to do and its time to pull the trigger. I think you'll be fine. When you take the formers out the hull often deforms no matter what. Then you straighten it back up. In your case you'll do some inside glassing after re-straightening. The online plans do have a section on straightening the assembly. I built the first and so far only Dayak as all Plascore. I'd like to make an all plywood Dayak someday. Perhaps when I'm 100. 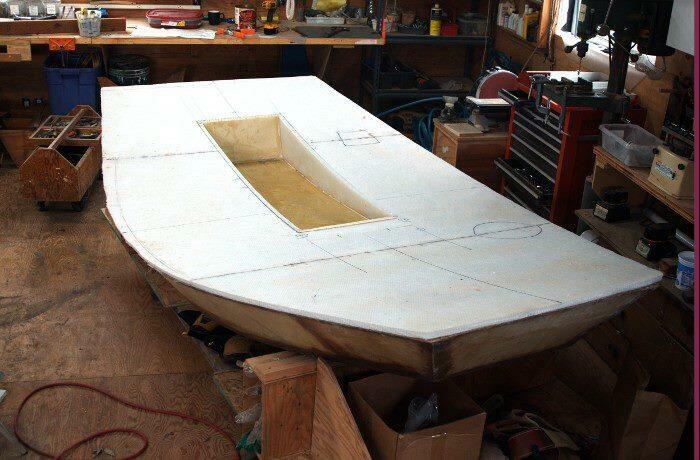 Larry Hedrick built a stretched out Honky Dory as all Plascore. Larry wanted a bigger boat so he added a 2' foot section to the middle of the HD layout. That made it longer without making it wider. I've rowed that boat. It's a fine boat. Me Larry and Dave Inskeep did a six day three person three boat Desolation Canyon trip two years ago. I need to make a bigger version of the HD plans using an 18' foot gunwale (instead of 16'). I'll scale it up proportionately, so it's wider as well as longer. I've got a lot on my plate right now. And at 70 I only have 4 or at best 5 hours a day to work with instead of 10. Speaking of Desolation Canyon I've done it both of the last two years. At 16,000cfs and 7,000 cfs. The lower water was definitely more challenging. A lot more challenging. Not only are there more rocks to thread between the waves are higher too. A lot higher. Every river is different. But on a lot of'em high water just washes everything out. I did Deso 5 or 6 years back at 38,000cfs. That was the easiest rowing of all. That year only Joe Hutch had much adrenaline. The rest was a long flat swirl. The worst part that year was all the submerged campgrounds. We spent 6 days camping higher up. On the rocks. Found an old Dayak photo, from the all Plascore hacking stage. I reworked that footwell a few times before glassing it. Eventually so the rear end was flush with the deck. And then put a 3" inch drain at the bottom, going straight down. I flipped the Dayak in Wire Fence on the Green this May. My stupid. The river bends sharp right at Wire Fence and there are huge waves close to the rock wall at river left. But between the rock wall and those big waves it's smooth. That's where you want to be. I saw Dave's big 17' foot decked Tatman boat nutting the big waves and completely disappearing between the swells and I made a bad decision. And tried to sneak right. And dropped sideways into ten foot hole. Next thing I know I was holding the boat with one hand and swimming with the other. I've been Wire Fence before. I know I could have made it tight left. I could have nutted those waves too. Sideways into a hole deeper than it is wide.................on the other hand.......is not what they call smart. Everything was flip rigged. I didn't lose anything. Dave and Whit pulled me out right above Three Fords Rapid. I didn't get that stupid again. This was Joe Hutch. About 20 minutes prior to upside down. The river changes at different flows. Joe Hutch is usually the biggest water in Desolation Canyon. Not this year. This may it was Wire Fence. By a big margin too. Thanks for the reply Sandy. I guess it just means I need to pull the trigger. I have yet to do a Deso trip but I've been thinking it may be the maiden overnight for this build. I have a year until Grad school is over and then its permit time. I do really have a hankering to run the Smith. Any idea how a loaded down Honky Dory will handle that river? It looks to run pretty low water most of the year for a boat that size. The local yokel rule of thumb for the Smith is 300cfs or above for rafts. 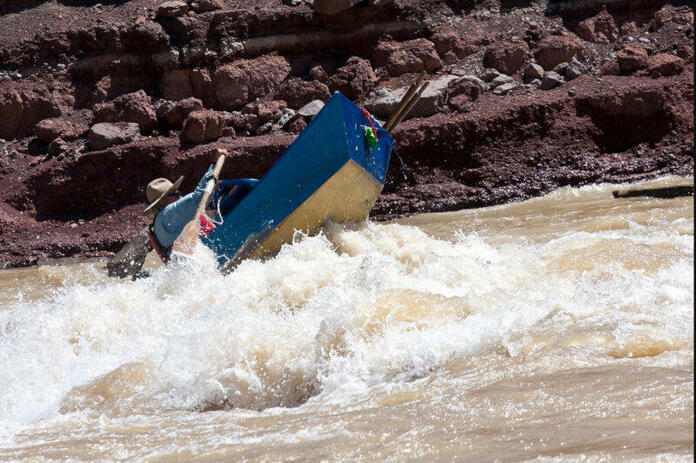 400cfs or above for driftboats. I did it one September at 360cfs. But that much water in September happens once every 10 years or so. Did it at 900 once. 500 to 600 is the best fishing. Fun beautiful float. No white water but you still need river skills.